My name is Lily and I'm currently a Biology student and an intern at our school's Office of Sustainability. I recently rescued a little leopard gecko that had been at our local pet store for the longest time. He had a very small vivarium, maybe about a gallon. So I got a 29 gallon tank for him, and decked it out with lots of hides and driftwood. His moist hide is a giant dinosaur head! His name is Preston Garvey, and he is probably around 2 to 3 months old. He loves to hunt, and is surprisingly tame so far. 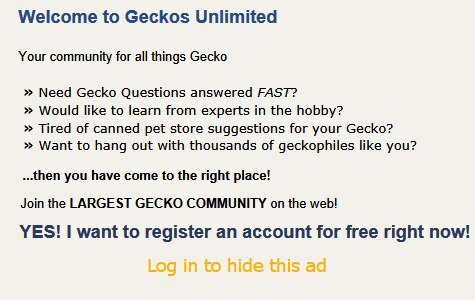 I look forward to meeting other people with leopard geckos, and to hear about everyone else's experiences! Welcome to GU! I think he's a bit older given his coloring. Welcome to Geckos Unlimited, Lily and leo Preston Garvey! Welcome! Love the name, and your tank is great! I don't have leos, but I have a crested, a gargoyle, a Bauer's chameleon gecko, and a Cuban false chameleon. I am enjoyhing this forum very much, and glad you are here!